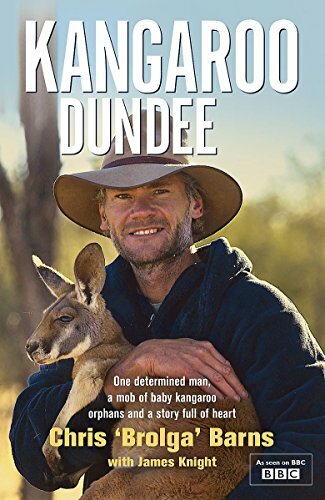 Brolga (aka Chris Barns) is the 6ft 7in strong but sensitive Aussie star of the extraordinary BBC series Kangaroo Dundee. Brolga lives in a simple tin shed in the outback where he raises orphaned baby kangaroos. It is a sad fact of life that kangaroo mothers are at the mercy of speeding cars in this part of the world - killed on the road, their young still tucked up in their pouches. These young joeys holding on to life, have been given a second chance thanks to the kindness and dedication of Brolga, who carefully retrieves them and nurses them back to health. Brolga has been rescuing these special creatures for years, slowly and painstakingly creating a kangaroo sanctuary for the many kangaroos he has saved, reared and loved. He has dedicated his life to observing how kangaroo mums care for their babies and does everything he can to replicate this. The baby kangaroos, traumatised by losing their mother so early, are tucked up into pillow cases and kept warm and comforted next to Brolga at night. We see him getting up at 4am to bottle feed them, washing them in a little tub, taking them to the supermarket and generally mothering them with heart breaking tenderness. Charting Brolga's life with the joeys and honing in on his relationship with one or two in particular, Kangaroo Dundee tells the heart-warming, sometimes funny, sometimes poignant story of one man's unique relationship with a group of extraordinary animals. Brolga lives in the Kangaroo Sanctuary in Alice Springs which he set up in 2005. The Sanctuary is a 90 acre wildlife reserve for rescued baby kangaroos.